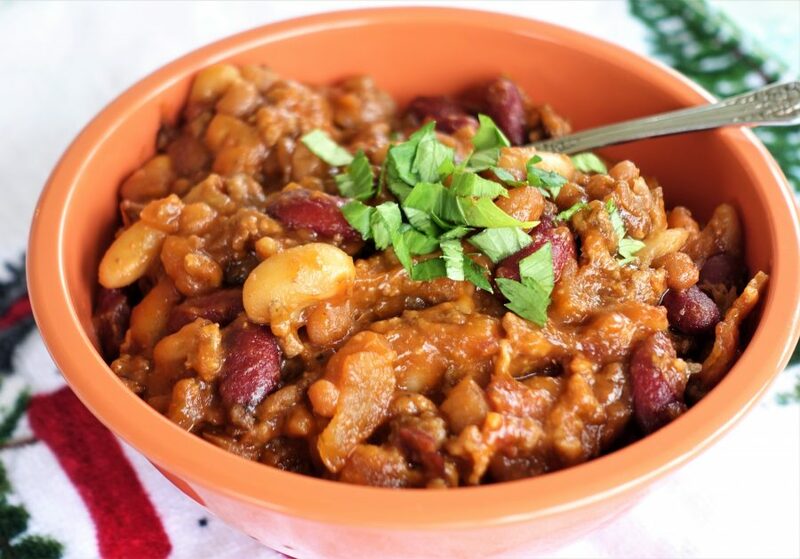 If you like chili, or baked beans, you will enjoy this Calico Beans recipe. It is very tasty and inviting on a cold winter day, or at a barbecue. You will not be slaving over the stove mixing it endlessly, since once you are done with all the prep work, it cooks slowly on its own, in a slow cooker. The smell of fried bacon, and barbecue sauce, plays games with everyone’s taste buds. Fry bacon in a frying pan. Remove fried bacon from pan, cool, break it apart, set aside. Remove most of the fat from the pan (or all of it, and use a little bit of oil). Add chopped onion and sauté it until golden. Add ground beef and simmer it until no longer pink. Fill a slow cooker vessel with all the beans, bacon, beef and the rest of the ingredients. Add a pinch of salt and pepper to taste (may add more salt if needed after it is cooked). Cook covered on low for 3 hours, or on high for 1 1/2 hours. This recipe resembles a mild chili dish, but with a more pronounced barbecue flavor. Tastes great with a piece of freshly baked bread. This sounds great for a cold snowy day like today! Beans are a great source of protein.